UNITED STATES: An auction will be held near the end of 2016 for a site off New York for offshore wind development, said Jim Bennett, renewables chief at the Bureau of Ocean Energy Management (BOEM). 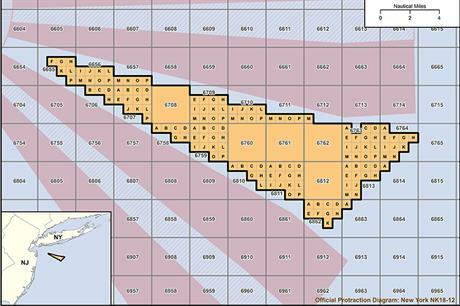 On 2 June, BOEM formally proposed an offshore wind lease sale of the 81,000-acre site. Companies that have previously expressed interest in the area are Deepwater Wind, Fishermen's Energy, Energy Management, Beautiful Earth Partners, EDF Renewable Energy and Sea Breeze Energy. Speaking at Windpower 2016 in New Orleans last week (24-26 May), Bennett also said that BOEM would "probably" hold an auction in 2017 for wind development off North Carolina. America's offshore wind sector is finally advancing. Deepwater's 30MW Block Island, the country's first, will be commissioned this year at Rhode Island Sound, north-east US. And in late May, a coalition of lawmakers in Massachusetts unveiled a bill mandating state utilities to contract 1.2GW of offshore wind from federal waters by 2027, off south Massachusetts and Rhode Island. The legislation, which is bound to meet resistance, was pioneered by Representative Pat Haddad. Dong Energy and Offshore MW — affiliated with Germany's WindMW — are already planning major projects in the area, which could host approximately 3GW of offshore wind. Wind project would be excluded.